With PICA’s TBA new-arts fest, Music Fest NW and the kickoff of the regular fall arts season, it was a hectic weekend in Puddletown. So Marty Hughley, The Oregonian’s ace theater and dance guy, asked me to pitch in and review God of Carnage, Yasmina Reza‘s little free-for-all at Artists Rep. Not a bad assignment, all in all. Funny what a little playground punch between kids can turn into when the adults get involved. My brief print review is in this morning’s paper. You can read the more expansive online version at Oregon Live. Barry Johnson has also filed his review at Oregon Arts Watch, and Willamette Week’s Ben Waterhouse shouldn’t be far behind: He was in the house on Saturday night. My old friend Bernie Weiner was a longtime theater critic for the San Francisco Chronicle, and, as the salesmen say in The Music Man, he knows the territory. So when he takes time out to send a tip, I pay attention. This is what he sent the other day: not sure if you’ve ever seen dan hoyle perform (he’s geoff hoyle’s son), but he’s wonderful. just in case you’re interested, he’ll be doing his “real americans” show (based on conversations he had with ordinary americans, not all of whom were friendly) in portland 9/6-11-6. The Real Americans also opened over the weekend, at Portland Center Stage. Rich Wattenberg’s review for The Oregonian is here. Also from The Oregonian, I ran this review on Friday of Tamarind Touchstones, an exhibition of 61 lithographic prints made over the past half-century by the Tamarind Institute, which began in Los Angeles and moved in 1970 to Albuquerque. It’s a very good show, with work by people you know (Josef Albers, Roy De Forest, Kiki Smith, Louise Nevelson, Robert Colescott, Richard Diebenkorn, Jim Dine, Ed Ruscha) and probably a few you don’t. It’s in the prints and drawings galleries downstairs from the main entrance, and it’s worth your time. 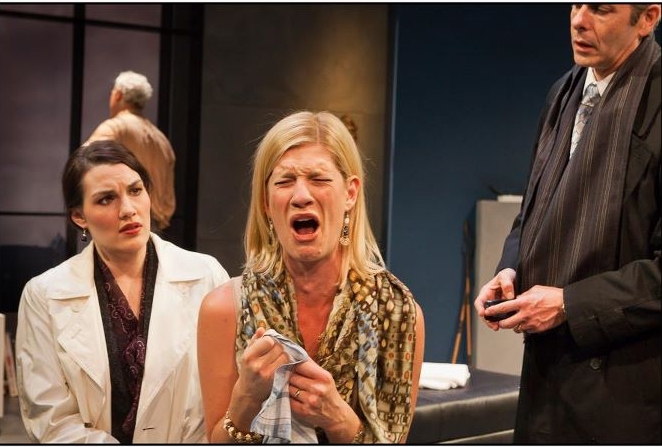 From left: Trisha Miller, Patrick Dizney (background), Allison Tigard and Michael Mendelson in “God of Carnage” at Artists Rep. Photo: Owen Carey. David Hare, “Cronus Hermaphrodite,” 1972. “Tamarind Touchstones” at Portland Art Museum. Courtesy Tamarind Institute.